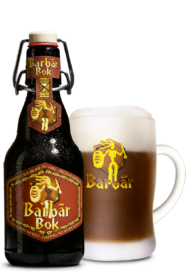 Barbãr Winter Bok is a solid and expressive brown ale, Barbãr Botha’s inherited its original recipe, based on malt, soft wheat and honey, from its famous big sister, it has an alcohol content of 8.5%. A solid and expressive brown ale, Barbãr Bok’s inherited its original recipe, based on malt, soft wheat and honey, from its famous big sister. With its honeyed and spiced nose, it strongly resembles Barbãr, but with fruit, malt and chocolate notes. A decided and slightly acid attack gives way at once to a malted, chocolate flavour. It is fairly high in alcohol, but without exaggeration. The finish is long, fruity, slightly piquant and without a bitter aftertaste. Barbãr Bok is uniquely complex and is a fine tasting beer particularly appreciated in winter.